Atten-shun! 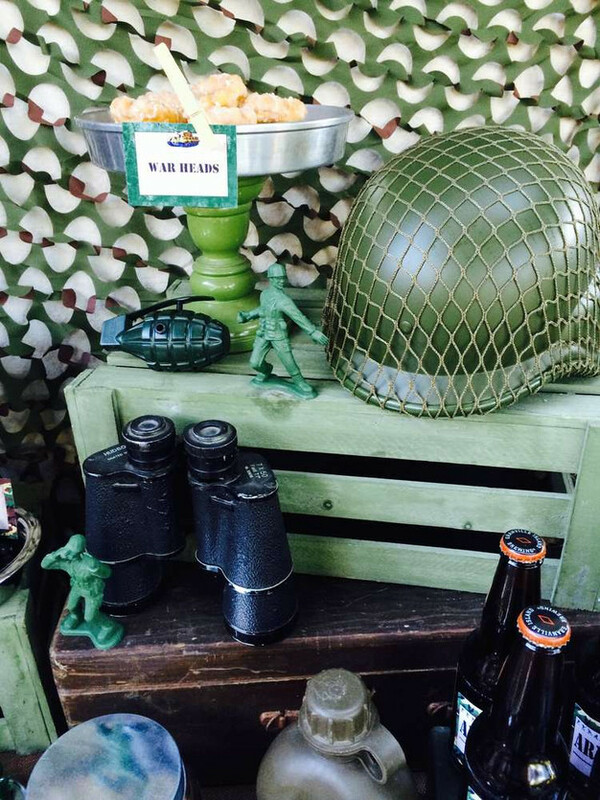 Got your marching orders on organising an army party and need some help? Then march onward, party soldier! Coming up with party decoration ideas can be daunting, so we have done some muddy work for you, and found some great tips and inspiration for your next party mission. Let's get marching! The best way to go for any army or soldier party is khaki green camouflage. 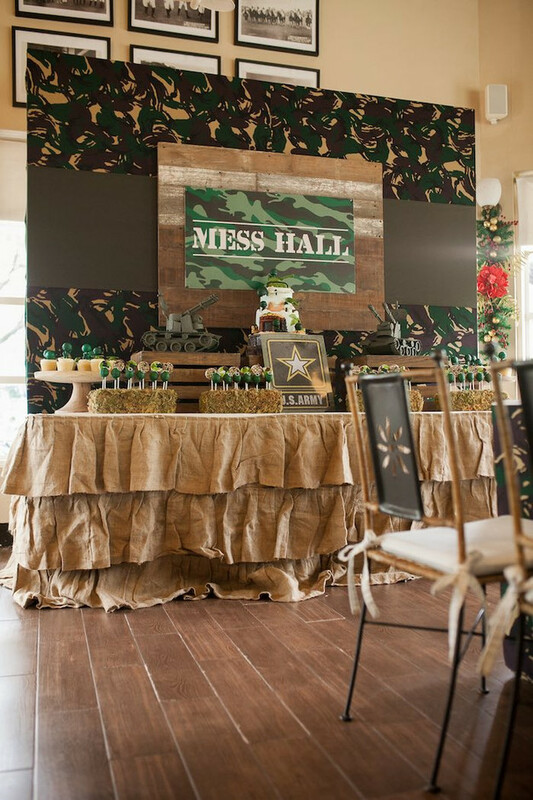 Most army party supplies will be in green camo, so sticking with this scheme will make your party planning much easier than searching for something unusual. 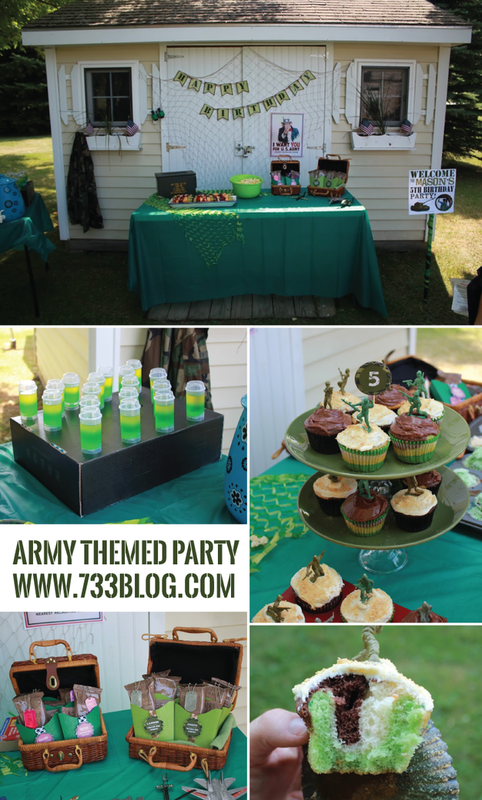 If you want to mix it up, consider teaming up green and tan for your colour scheme, just like this awesome party featured at Kara's Party Ideas, submitted here. Personalized party invitations are always well received by party guests, and help to excite them about your upcoming celebration. Party invitations offered by The Digi Dame Party Shoppe are DIY editable, so you can conveniently and easily download, add your own text to personalize and print at home. And best of all, coordinating party packs are also available, providing you with instant party style! 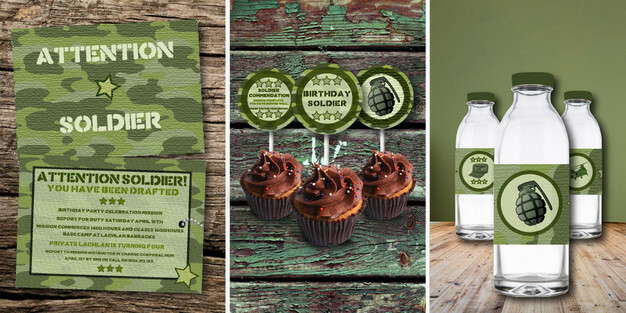 Perhaps get your soldiers ready for action by including some fun army themed stickers or temporary tattoos with the invitations - your guests will love them! You can totally create a military atmosphere, even on a budget. Below are some great ideas. Get Real. 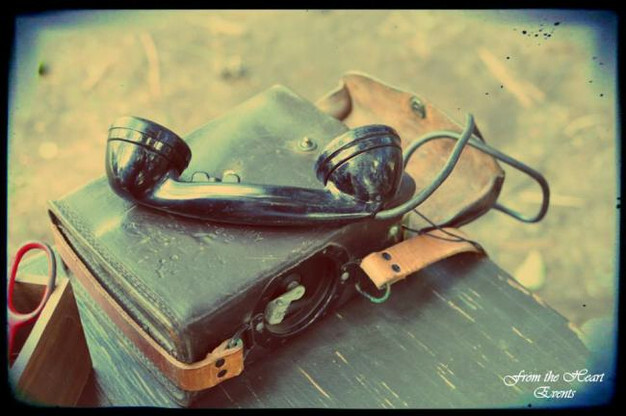 If you, or someone you know, owns any vintage army/military equipment, you can incorporate it into your party venue for an authentic atmosphere. Consider using tents, netting, signage, uniform items or other genuine articles for decoration. Spaceships and Laser Beams have some wonderful examples here, provided by From The Heart Events. Rustic wooden crates and tin cans can help to create the perfect party atmosphere. Here is a great example of this, posted by Catch My Party. Blow it up. Balloons are a cost effective way to decorate any party venue. An army party is no exception. Tie little plastic soldiers to them with string, to create a parachute effect. Army Speak. Using the correct lingo will help to set your army theme. Hang signs using military lingo to designate certain areas e.g. "Mess Hall" where the food will be served, "Barracks" on the doors of bedrooms, and "Boot Camp" or "Recruit Training" where the activities will be held. Decorating your army party table need not be a difficult mission. It can be as simple as covering it in a khaki coloured sheet or camouflage fabric. Hessian or burlap/canvas will work just as well. 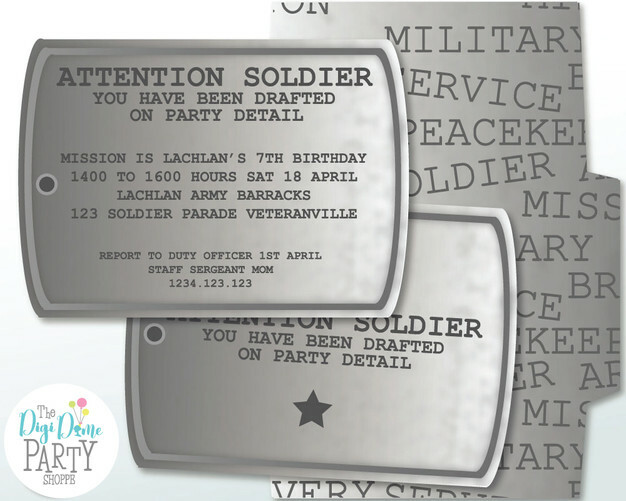 Printable decor is a very quick, easy and cost effective way to decorate your party venue and provide favours for your party soldiers. 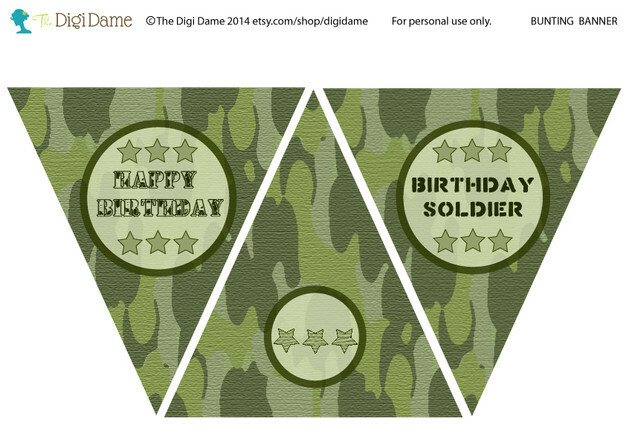 A selection of army party printables are available at our Online Shop and Etsy Shop. 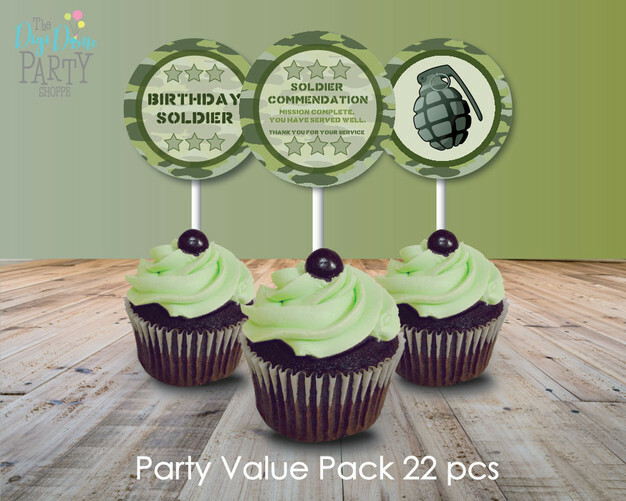 These include decorations such as banners, tabletop printables and labels, photo booth items, and party favours such as placemat commendations and medals. You can make your own party favors by turning green plastic eggs into army grenades and filling them with treats. 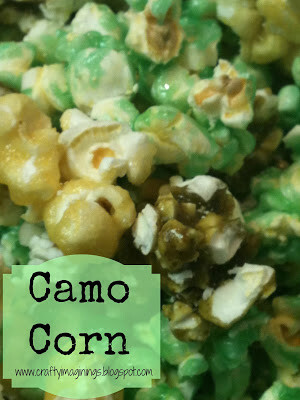 Crafty Imaginings has a recipe for "Camo Corn" here. Party games are a great part of army parties, especially when they are held outdoors. Sending the guests on a joint mission is a great incentive prior to the cutting of the cake - perhaps getting them to work together to decode a secret message! Some other outdoor ideas are below. Somewhat Simple features some great ideas here. Inspiration Made Simple also shares wonderful tips and suggestions here. 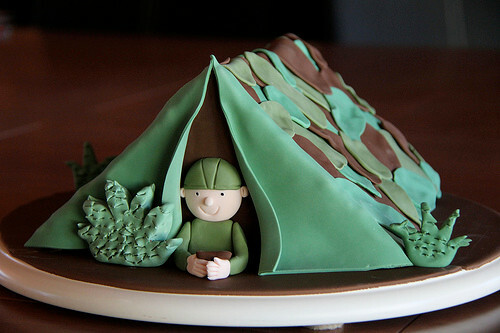 Big Fat Cook showcases amazing inspiration for army cakes here. Now, are you ready for your FREE party printable? 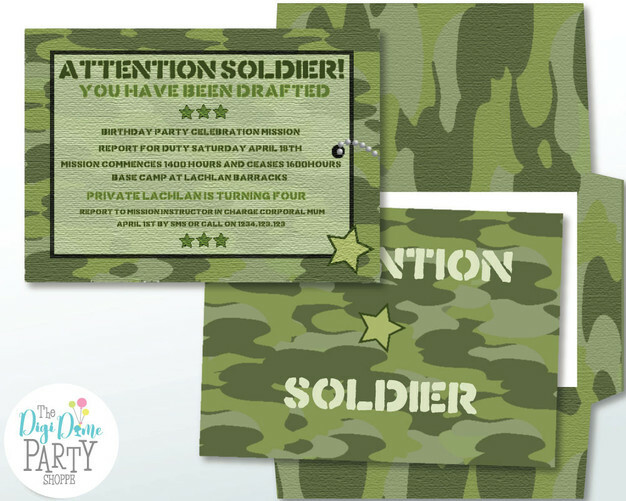 To celebrate all things army and to get you started on your party plans, we are giving away a sample from our Army Party Printables Pack. Click here to download this bunting in PDF format. Never miss an update! Subscribe to The DigiHood below and receive FREE and EXCLUSIVE party printables! 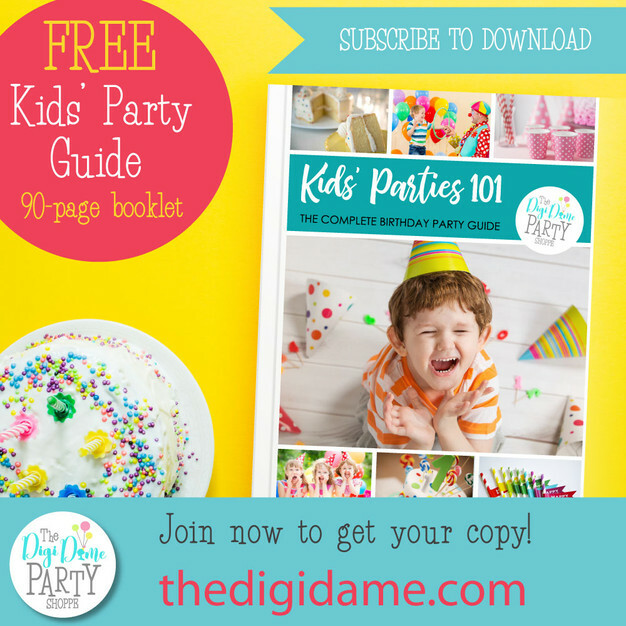 Click here to JOIN OUR PARTY and get your FREE Kids' Party Guide! So, that's it! We hope you have found some inspiration from these awesome examples and are now ready to plan your military mission!